Vegetarian Black Bean Burgers – we’ve tried tons of recipes and this one is the BEST! This post contains Amazon affiliate links, which, if you buy something won’t cost you any extra, but will help support this blog. So, high five to you! In fact, even my meat-eating husband has said that he prefers these patties to store-bought beef patties sometimes! How awesome is that! I’ll make a batch of these Vegetarian Black Bean Burgers and freeze them so we have a nice convenient homemade dinner. If you do this, you’ll want to lay the patties on a silpat on a baking sheet. Cover each patty individually with a small piece of aluminum foil, and place the baking sheet with the covered patties in the freezer. Once they’re frozen, remove the patties from the silpat and wrap each individually with foil. Place individually wrapped patties in a ziptop bag, and keep in the freezer. If the patties aren’t wrapped individually they may stick together (yep, I’ve done that more than once!). If the patties are frozen this will increase the cooking time a bit. Just use a slightly lower temperature so that the patties don’t burn. And, keep an eye on them as they cook. We’ve also made this recipe using a meat grinder. We place all the ingredients (except the egg and spices) into the meat grinder. The patties come out great this way! I don’t think too many people have meat grinders (or use them if they have them), but if you do, I highly recommend this method. How can I top my burger? As for toppings on your burger, use whatever you like! My husband likes his burgers simply with easy homemade ketchup, lettuce, and some cheese. I love guacamole and easy enchilada sauce on mine for a more Southwestern flavor burger. The burger in the picture above has cheddar, onion rings, smashed avocado on a sesame seed bun. However you like your burger, you’ll be super happy with this veggie patty. Patties waiting to be cooked up and eaten! Roasted red pepper hummus sandwich with tomatoes, cucumbers, and caramelized onions. A Veggie delight! In the bowl of a food processor, grind black beans. Add in bell pepper, onion, chili powder, cumin, and chili paste and grind together. Transfer black bean mixture to a medium bowl and gently mix in egg. Mix in bread crumbs until the mixture holds together. Divide mixture into four patties and place on lightly oiled aluminum foil. Cover with plastic wrap and refrigerate at least 30 minutes or overnight. If grilling, preheat grill to high-heat. Keeping patties on the foil, place the foil onto the grill grates, and grill about 8 minutes on each side. If cooking inside on the stove top, heat 1 teaspoon oil in a large nonstick skillet over medium heat. Add patties to pan and cook until golden brown on one side, 4 to 5 minutes. Flip patties and cook until underside is golden, 4 to 5 minutes. Just in time for summer grilling, I’ve been looking for a good veggie/bean burger. Thank you for the recipe. This looks awesome! 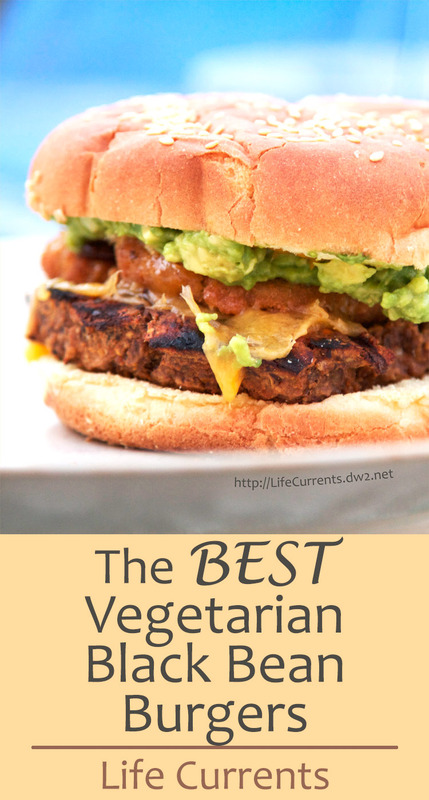 I love veggie burgers and I’m a fan of black beans so these are on my list! Great flavours you have got going on here, I’ve never tried black beans as a vege burger (primarily because the are tough to find) and usually fall back on chickpeas and lentils to form my patties. I love black beans burgers, and I also add some quinoa to them. Yum! That’s just awesome, despite not being vegetarians, I love vegetarian burgers, there’s just something about the flavours! I love that you can freeze these too, great for midweek!